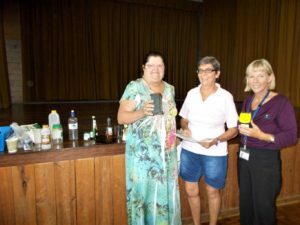 Ellie Webb, Council’s Waste Education Coordinator (pictured right with Carmel Newton and Monica Foster), explained to the Tin Can Bay Craft Club just what can be recycled in our district. Courtesy of GRC, 35 members bused to the Hervey Bay recycling plant, in the hope everyone in the community will become more aware of the need to cut down on waste. Ellie said to buy a ‘keep cup’ for when you purchase a takeaway, as thousands of cups used each day are not recyclable; many shops are now giving a discount using your own cup! On April 5, Roz, Cathy and Mary will be tutoring candle wicking, and Bev Dunn will help members make a bag on April 19. All welcome, just call Thursday morning at the TCB Community Complex, and have chat and a cuppa, or call Carmel: 5488 0409. Local quilter takes top prize at the Brisbane Ekka!